PLECS® tools can be applied to many disciplines of power electronics engineering. Conceived with a top-down approach in mind, PLECS facilitates the modeling and simulation of complete systems, including power sources, power converters, and loads. Included with PLECS is a comprehensive component library, which covers the electrical, as well as the magnetic, thermal, and mechanical aspects of power conversion systems and their controls. Power electronics circuits are captured with a schematic editor in a way that is familiar and intuitive for electrical engineers. Typical power electronics components such as semiconductors, inductors and capacitors are placed on the circuit diagram and simply connected by drawing wires. The above PLECS circuit models a flyback converter with two secondary outputs. 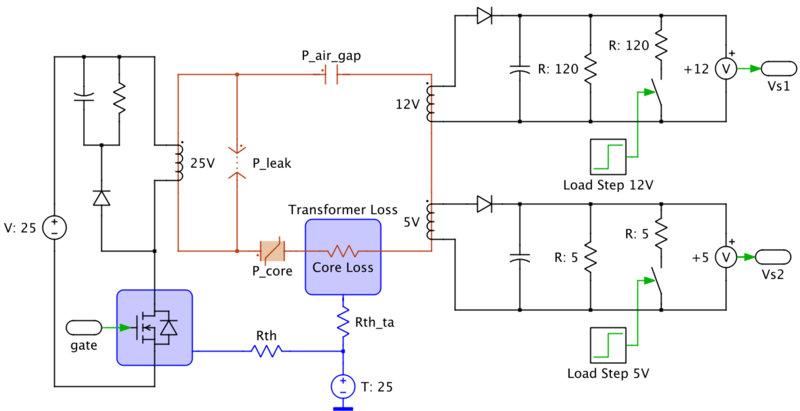 The losses of the main switch and the transformer are captured by a virtual heat sink and coupled into the thermal domain for temperature estimation. The transformer is represented by a magnetic equivalent circuit which models the B-H saturation curve of the core material.